Kendrick’s teacher is the best! She has been so helpful and caring for our son and he loves her very much. She goes out of her way to find things that will help our son: she reminds him to breathe when his tics get bad, she lets him stand up in front of his desk when he needs to, she lets him move around during carpet time, etc. Amazingly, two weeks before school started she saw a documentary on Tourette and was thus able to immediately understand what we were talking about on the first day of school. This in itself was such a blessing, but her care and attention have been more than we could hope for. My son is in a French immersion program in second grade. There are more than 25 students in the class and she gets help only from parent volunteers, from what I understand. That in itself is a makes her days full and challenging. And yet she has been there for us and Kendrick. Towars the middle of the year she suggested we have Kendrick considered for special accommodations due to his “disability”. For me, this was a very difficult request. This was going to make me admit there was a problem and put that admission on file. This was going to “officialize” the syndrome. Through her patience and preparation though, the process was seamless. She prepared everything and made the best recommendation. Today I’m very grateful for her suggestion and I know it was in my son’s best interest. Now if he has tics during a test and they hinder his ability to write he has the possibility of taking a break and getting more time. Also if his tics disturb other children then he can take the test seperately. We are so greatful for her help and love. Various off-label drugs are prescribed by medical professionals for Tourette, but of these, only two – Pimozide and Haloperidol – are approved by the FDA for the treatment of Tourette. According to TSA, these medications often provide only mild to moderate benefit and have poorly tolerated side effects that limit their use. The first Neurologist we went to see prescribed Clonidine. We went and got the prescription, but when I got home I saw this was a medication for high blood pressure. Of course, I called the pharmacy to say there was a mistake, but they confirmed that that was the medication that was prescribed and that it was sometimes used for tic disorders. This was an off-label drug. I was in total shock, how can a high blood pressure medication be given to my 7 year old son? I felt terrible giving this to him but I had no choice. My son was having 30 tics a minute and could not stand it any more. We could not stand seeing him suffer like this anymore either. So we gave him the medication and saw his tics get better within 24 hours. It was such a releif. Unfortunately he started yelling and screaming throughout the following week more and more. He was repeating the word “maybe” constantly. He started each sentence with the word “maybe”, stuck it in the middle and ended the sentence with it as well. We could not understand what he wanted to say. Clearly this drug was not going to help sufficiently. I went to the library today to get some books on the gluten-free diet. There were only three books there. I was quite surprised seeing all the hype recently on this diet. Anyway, I picked up “The kid friendly ADHD & Autism Cookbook” by Pamela Compart M.D. It proclaims to be the ultimate guide to the gluten-free, casein-free diet. The first five chapters were great. I learnt a whole bunch about problem foods and why they are problematic. For me that is important to understand. For example I had heard sodas were bad and somehow you needed to drink 8 glasses to compensate. Here they explained that sodas were high in phosphorus and excess phosphorus can bind essential minerals so that the body can’t use them. So they actually take nutrients away! They also talked about salt, oils, milk, soy, cholesterol, proteins, etc… Next chapter talks about breakfast ideas and packed lunch essentials. Can’t wait to read the rest. I noticed my son twirl for the first time two weeks ago. We were at a swim meet and he was standing in line and twirled. He did it again at the next event and again while waiting to talk to the coach. I was not feeling good about it. It bothered me. First of all it was his first new tic in a long time, several months, I think. I thought we had seen them all so for me this was maybe a sign that the syndrome was progressing or continuing to evolve. Then there is the fact that this is a very complex motor tic in my opinion. Like jumping. But are little tics any better? Anyway, so tonight he twirled and walked to the coffee table from the kitchen. Now that I’m used to his twirling I think it is ok. Kids twirl all the time so socially it is probably better than jumping. 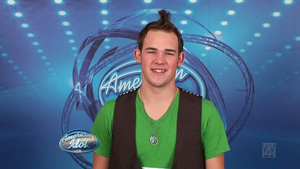 American Idol Top 3 Finalist James Durbin Rocks the Lives of Those Living with Tourette Syndrome. Our Chiropractor has suggested that my little man follow a gluten free diet. Now I have heard of gluten free diets, I see gluten free products in the supermarket, but I have no clue what gluten is. Dictionary.com says it is a protein that is present in cereal grains, especially wheat. When you look at the definition of the noun it says it is a nitrogenous substance, which does not sound good at all, and Wikipedia site says that that if you follow this diet you do not consume the recommended number of grain servings per day and so you do not meet the recommended intake for fiber, thiamine, riboflavin, niacin, folate, iron, or calcium. The reason our Chiropractor recommends this diet is because of several studies that gluten damages brain nerves. So, of course, I will do this. But I feel overwhelmed at yet another diet. Especially since we are already on a yeast free diet. They are related, I suppose, but I finally found good bread that does not have malt or vinegar and now I have to eliminate that probably. What am I going to feed my “mac n cheese” lover? She is amazing. She’s always full of energy and so much hope, it is refreshing! So I’m off to surf the web to get more info and some recipes. Any suggestions?